Could Australia Suffer A Mortgage Crunch Too? A week of global financial instability was triggered by an overdue correction in a comparatively small equity market based on indices of Chinese “A” shares – those which only Chinese can own. Global markets have barely blinked before when Chinese stock markets have done silly things (and they are renowned for their volatility) but this time it was different. This time a nervous mood had been established beforehand as risk in general came sharply into focus. The catalyst for a reassessment of risk was the US sub-prime mortgage market. (Sub-prime in the US is what Australians better know as lo-doc or similar mortgage arrangements). As the US housing market has been in a painful decline now for some time – with little sign of light at the end of the tunnel – it is no surprise that homeowners with overstretched mortgage obligations would be feeling the pinch. Thus it was that a sudden spate of defaults caused some fatalities amongst sub-prime mortgage lenders, and credit default insurance spiked. While one little old mortgage does not seem overly important in the global scheme of resource booms, surging economies and trillion dollar financial market turnovers the importance of the individual mortgage cannot be underestimated. For what is an economy if not a collective of individuals with aspirations of wealth? A home is the most significant asset an individual will ever own, and its cost dominates the budget of every homeowner. The rest of the economy thus depends on what is left over from the monthly budget to spend on everything else. It is also dependent on the perception of wealth created by improved property value, and how this, too, affects spending patterns. A growing economy is only the end result of a chain which begins with individual spending. Thus it follows that a surge in mortgage defaults can bring down an economy – or at least send it into recession. Banks rein in their lending, property prices fall further on foreclosure sales, consumer spending takes a hit and workers are laid off. Factories close down, resource prices fall, stock prices fall…all in all a slippery slope. Long before this recent bout of financial volatility questions have raised about the current level of debt in Australia. Total debt in Australia is running at around 152% of GDP. This compares to a level of 82% in 1990, before the great property boom began. RBA governor Glenn Stevens was given a grilling last month when he made his annual testimony to parliament. Asset prices are greatly inflated from 1990 levels. Debt has run amok. What would happen to the economy if asset prices turned down? “The rough statistic that I have quoted many times”, said Stevens to the assembled parliament, “was that the average rate of interest was about half [of that of 1990]; that meant you could service twice as big a debt. Guess what? This is exactly what occurred, and that had a very profound effect on asset values”. In other words, Stevens is dismissing any overblown fears about debt levels. Rates are half what they were, so asset prices are double. Equilibrium is maintained. This vanilla economist view does not sit well with Dr Steve Keen, Associate Professor of Economics & Finance at the University of Western Sydney. Dr Keen may be familiar to FNArena readers for his previous warnings on Australian household debt levels (Australia’s Unavoidable Recession; Sell&Buyology; 15/11/06). Dr Keen despairs that because most economic models assume the economy is always in equilibrium, most economists, including Glenn Stevens, believe the “actual” economy is in equilibrium. “A closer examination of the data makes it obvious that this belief is false”. While the interest repayment burden is indeed equivalent today to what it was in 1990, notes Dr Keen, it does not follow that a state of equilibrium exists. Indeed the level of interest repayment burden in 1990 represents the highest level the burden has ever reached. Why is 1990 such an important benchmark? Because therein followed a lengthy period of crippling recession. Keating’s famous “recession we had to have”. Stevens is “relaxed and comfortable” about debt levels. Dr Keen can’t see how anyone could be comfortable about a debt burden level approaching the maximum. Part of the problem is the source of the debt. In 1990, mortgage debt equated to only 17.8% of GDP. Business debt, on the other hand, grew from 26.5% in 1980 to 56.4% in 1989. This was the era of Bond, Holmes-a-Court and Skase. Business learnt its lesson after the crash of 1987 and the subsequent recession. Business debt fell to 40.7% in 1995, and has only now returned to the levels seen in 1989 – but don’t forget interest rates are now half. In contrast, mortgage debt, which was 19.8% in 1990, is now 82.2% of GDP and growing at a rate of 6% per annum. On this basis, can 2007 really be compared to 1990 in terms of equilibrium? Dr Keen suggests the two are very different disequilibrium responses. If the RBA’s claim of equilibrium in the economy is true, Dr Keen suggests, then the growth of the total debt burden should rise as interest rates fall – as it has – but also fall as interest rates rise. While rates have starkly risen and fallen over the period of the eighties to now, the total debt burden has only gone in one direction – onward ever upward. In fact it has been growing exponentially for the last 44 years. It is an economic reality that this trend cannot continue forever. If it did, the debt burden would ultimately exceed income. Some time before this occurs a ceiling must be reached. What the ratio is trending towards is a state of national bankruptcy. It follows that when the debt to GDP ratio stops growing, so does the economy. There has already been an alarming – if not catastrophic – surge in mortgage foreclosures in Australia. Most of the damage has been done on the east coast, which is no surprise given the state of the economies of NSW and Victoria. The RBA doesn’t give truck to arguments about dual economies however, happy that the resource states are balancing out the equation. Real alarm bells would go off if mortgage defaults suddenly accelerated in Perth. Is the current level of default thus any cause for alarm under Dr Keen’s scenario, and given the concern in the US? Macquarie Bank economists think not. It is oft noted that the housing boom in the US lagged that of Australia. The east coast of Australia had already begun to suffer a pullback before the start of the current US decline. The resource states have still been on the up. While inevitably the resource states must reach a blow-off top of their own, the signs are that the east coast property market has already bottomed. Building approvals in the east have now fallen below the level required to satisfy accommodation demand. Hence we have rapidly rising rents. As property yields spike, and equity markets look toppy (or at least dangerous), investment property will once again become attractive. Moreover, rates are on hold for at least the time being. “While the Australian housing market is better placed from a supply-demand perspective, the collapse of the sub-prime market is causing additional angst in the US, which is not present in Australia”, note Macquarie economists. Sub-prime mortgages account for 10% of the total US mortgage market. The RBA has determined that sub-prime accounts for only 4% of Australian mortgage-backed securities. The default rate for US sub-prime is currently 10%. The default rate for Australian lo-doc loans is 1%. The conclusion is that Australians need not be worried about their own mortgage market – yet. But what about business debt? Warnings have escalated recently regarding the resurgence of leveraged buyout activity not seen since the eighties. “Remember ‘87”, rail the soap-box orators. The largest LBO in global history was pulled off only a couple of weeks ago, financed by over 80% debt. It’s no wonder the doomsayers are agitated. As Australia’s total debt to GDP ratio stands at a record high, any pull back in capital spending would also have a significant effect on the economy. An inevitable “bust” is not yet apparent however, as business debt is only at the same level as 1989 on half the interest rate. But since last week the world has stopped to re-examine overstretched levels of risk. “But while this is a serious risk, the nature of investment may provide the economy with a partial cushion, at least temporarily”, note Macquarie economists. “That is, the very large infrastructure and resource projects that dominate investment spending at present are often very long-term projects that can’t be terminated overnight and they generally have secure sources of funding”. A global slowdown will not derail major resource supply-side expansion – which takes years to achieve – nor the raft of government infrastructure projects. The RBA kept rates on hold today, with one eye still firmly on the global economy, and on any renewed signs of inflation. This holding pattern is expected to remain in place for a while, which is a comfort for risk-burdened investors both in business and privately. Were rates to be increased once more, the debt problem would be glaring. Dr Keen believes the RBA is wrong to target inflation when debt is at such a perilous level. Were the next move in rates to be down, the pressure would ease. But then individuals would be free to borrow more money. 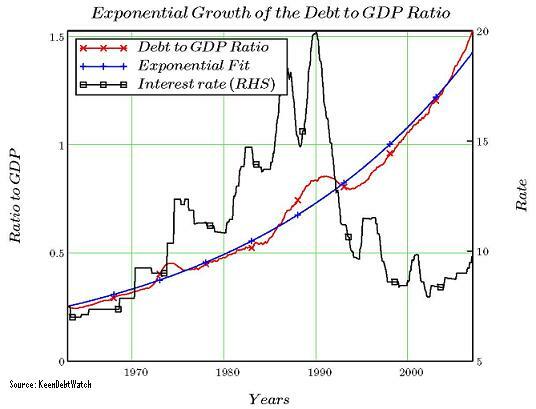 Footnote: Dr Steve Keen has now established a “debtwatch blog” at www.debtdeflation.com/blogs.